The Cory Holly Book Series is designated for free public access education. Please download any book available in audio or printable PDF format. Enjoy! The Cory Holly Series consists of several books in audio or printable eBook format that address a variety of topics related to health, fitness and human performance. The series was developed, researched, written, edited and narrated by Dr. Cory Holly and Tracy Kaye Holly CSNA Master. 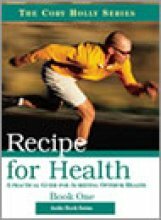 The series begins with Dr. Holly's foundation book Recipe for Health and is followed by the next book in chronological sequence. Listen to or read each book to supplement your existing knowledge and expand your personal awareness of holistic sports nutrition, health & fitness. Each book is available in either printable eBook format or MP3 audio digital format, which is ideal for convenient listening on your iPod or MP3 player. Convert each audible book to a CD or plug your MP3 player into your car stereo and learn while driving.